Wear schedule: How long can I use this contact lens without removing it from my eye? Replacement schedule: When is this lens so worn out that it should be completely discarded and never used again? Before you use any contact lens (CL), it is important to find out both the wear schedule and the replacement schedule for the lens. This is true regardless of whether it is a CL that corrects your vision or a cosmetic CL or a combination of both. Not following the recommendations can cause serious eye problems that may or may not result in temporary or permanent loss of vision. Please keep in mind that even though two CL:s are made from the same material, they can have vastly different wear and replacement schedules. Until the late 1990s, most contact lenses (CL) were only intended for use while the wearer was awake. When it was time to go to sleep, the lens was taken out and stored in a special lens box filled with a solution that helped keep the lens clean and wet. This type of contact lens is still very popular worldwide and is called a daily wear (DW) contact lens. 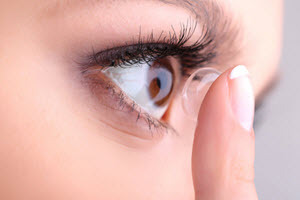 In the late 1990s, silicone hydrogel contact lenses became available. These lenses offered better oxygen permeability, which meant that plenty of oxygen could pass through the lens and reach the cornea. Today, it is possible to purchase contact lenses that you don’t have to take out during night. You use them during the day, sleep with them, and continue to use them the next day. 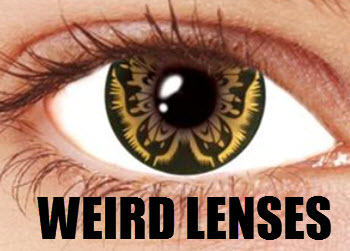 This is extended wear (EW) contact lenses. Of course, extended wear CL:s shouldn’t be kept in forever. Always follow the manufacturers recommendations. A common limit is 6 consecutive 24-hour periods. When a DW CL can be used for several weeks without being taken out, it is commonly referred to as a Continuous Wear (CW) contact lens. It is for instance possible to purchase contact lenses that are intended to be kept in the eyes for 30 consecutive 24-hour periods. Why shouldn’t I wear my DW CL:s when I sleep? When your eyes are open, oxygen from the air is dissolved into the tear liquid. From this liquid, oxygen can be passed to your cornea even if you are wearing a contact lens. When your eyes are closed (e.g. because you are sleeping) the eyelid is keeping air from entering your eyes. To keep your cornea healthy, blood vessels on the inside of your eyelid will provide the cornea with oxygen. However, a DW CL will block too much of this oxygen from reaching the cornea. 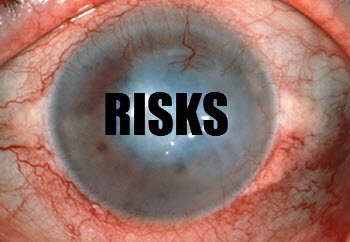 Corneal hypoxia (not getting enough oxygen to the cornea) can result in serious eye problems, including corneal ulcers. The effects of corneal hypoxia can permanently decrease vision, especially if the problem isn’t detected and dealt with early. EW CL:s and CW CL:s will allow much more oxygen to pass through from the blood vessels inside your eyelids. Compared to a DW CL, a typical EW CL will let through at least 5 times more oxygen. This is why EW CL:s and CW CL:s can be used during sleep without causing corneal hypoxia. Annual soft contact lenses (CL:s) used to be quite common. This was CL:s that you would take out before going to sleep and then insert into your eyes again when you woke up. They were intended to be used during your waking hours for 12 consecutive months and then discarded. Today, annual CL:s have largely been replaced with lenses that need to be discarded earlier. Quarterly lenses are similar to annual lenses, but should be discarded after 3 months. Just like the annual CL:s, the quarterly ones are not very popular today as more people opt for short-lived CL:s.
There are two main type of monthly CL:s.
Monthly CL:s that are kept in the eye for the entire month. Monthly CL:s that are only used when the wearer is awake, and stored in a liquid filled lens-box during the rest of the time. What they both have in common is that they are discarded after a month. This is a broad category where we will find a vast selection of CL:s. Always follow the manufacturer’s instructions. If the manual says that the CL:s should only be used when the wearer is awake and that they should be discarded after 2 weeks, don’t think that you can keep them in around the clock and compensate by discarding them after just 1 week. Single-use lenses are discarded after just one use. Of course, how long one use is depends on the wear schedule. For a DW single-use CL it will be just from waking up to going to sleep. For an EW CL one use will continue for several days, while a CW CL is used for several weeks without being removed from the eye. What all single-use CL:s have in common regardless of wear schedule is that you never take out the lens and put it in a liquid filled lens box to preserve it for future use. Once removed from the eye, the single-use CL is thrown in the trash and never inserted again. Single-use DW CL:s is a fairly modern invention that has become extremely popular among CL users. You put in the lenses when you wake up, and when it is time to go to sleep again you discard them. 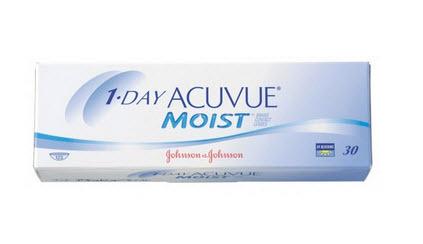 The next morning, you put in a new and fresh pair of lenses. Since these CL:s only have to last one day, they can be made very thin and light. Because of this, many wearers are more comfortable with daily disposables than with more durable CL:s.
Another benefit with daily disposables is that since they are used for such a short time before being discarded, the risk of a potentially damaging build up of bacteria,virus, fungi, pollen, etc is smaller. The wearer doesn’t have to worry about accidentally not cleaning and storing the lenses correctly over-night or risk long-term build up of unhealthy particles when the lens is in the eye (EW & CW lenses). A group that has embraced single-use CL:s especially eagerly are those who only wear CL:s once in a while. If you normally wear glasses but prefer CL:s for certain activities, e.g. riding and clubbing, EW & CW contacts aren’t ideal, and you might not want the hassle of storing multi-use CL:s between those occasional instances of lens wear. Last but not least, daily disposables makes the prospect of accidentally losing a CL less daunting. After all, it was due to be discarded today anyway. Just open up a package with a new fresh CL instead of desperately searching the floor for a (now pretty dirty) CL. 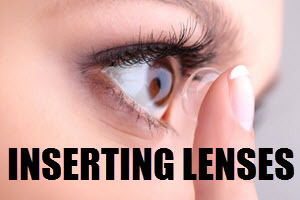 Modern rigid gas-permeable contact lenses will normally last for a few years before they need to be discarded, but there is a lot of variation within this field, so it is extremely important that you follow instructions from the manufacture and from your optician or eye physician concerning your specific rigid lenses and medical situation. The old PMMA-type rigid contact lenses were even more durable and the wearer would normally not need to discard them more frequently than every 5 to 10 years. They did however come with several drawbacks and are exceedingly rare today.